Powermite, South Africa’s industry-leading supplier of electrical and mechanical equipment for moving machinery, has boosted its superior quality, rugged and reliable cable reeling systems with the introduction of the new SR-Express range from Conductix Wampfler. 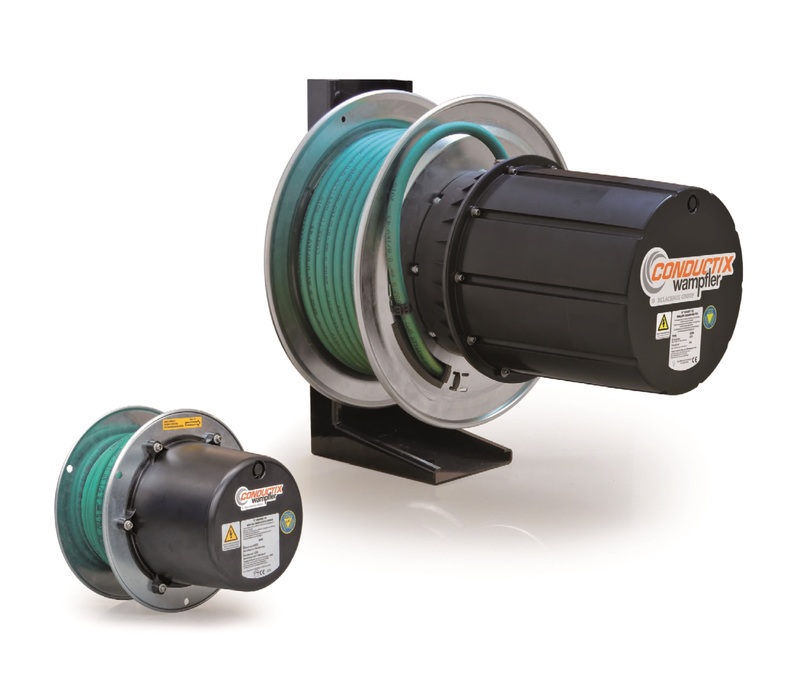 Spring cable reels are the culmination of Conductix-Wampfler’s over 100 years of experience in electrification systems and demonstrate the company’s know-how and expertise in the manufacture of world-class energy and data supply solutions for mobile industrial machines. The new SR-Express SR10-SR60 range is a selection of spring cable reels from Conductix-Wampfler’s global SR range and is a tailored response to customers’ expectations. Combining the best qualities of the company’s cable reels, the SR-Express range has been engineered to meet the energy and data supply needs of moving machinery that requires energy and data transmission systems including overhead bridge cranes, gantries, mobile tables, aerial ladders and lifts, elevators and elevated work platforms. The SR-Express is supplied with the cable already installed and connected to the slip rings so that it is ready for use to keep downtime to a minimum. Quality and reliability is part of the DNA of the SR-Express components; from the cables and cable drum to the slip rings, springs and mounting flange, all components are manufactured from the best and most durable materials to ensure operational efficiency over a long life cycle. The halogen-free PUR (polyurethane) cables, specifically designed for reeling applications, provide excellent wear resistance and high flexibility. The drum body and flanks of the cable drum are manufactured from robust zinc-plated steel. The flank edge has been designed to optimise cable arrangement during winding and to ensure safety for the user. With winding diameters ranging from 170mm to 400mm, the cable drum is fitted with sealed ball bearings and is lubricated for life. The USR heat-resistant slip rings are part of a new European range and feature a new design that both facilitates and reduces maintenance. The slip rings are located in an ABS-PC techno-polymere housing outside the cable drum for optimal access to connection. This impact-resistant slip ring housing is protected from dust and moisture ingress and is equipped with captive screws and a breather to prevent condensation. Customers and end-users have a choice of three bracket options – fixed bracket, fixed bracket and roller guide arm (available on all models) as well as fixed bracket and roller guide arm and swivel bracket (for SR10 to SR50 models). With an IP65 rating, the rugged and versatile SR-Express range is suitable for both indoor and outdoor applications, performing optimally in extremely stringent conditions and an ambient temperature range of -20°C up to +60°C for the standard E0 environmental specification and as low as -40°C for the E1 specification. An E3 option for severe conditions will be introduced at a later stage. The spring cable reels are protected against dust and water ingress and are able to withstand an impact of 20 joules. With over 40 years of experience, Powermite is perfectly positioned to offer a complete solution for moving machinery in bulk materials handling applications including cable festoon systems, festoon hardware and accessories such as cable guiding, anchoring and damping devices, junction, roller and connection boxes as well as cable connectors, organisers and clamps. Motor-driven, level wind and manual reels as well as cables, hoses and accessories for reeling systems complete the turnkey offering from Powermite’s materials handling division. All products are supported by excellent service and after-sales service delivered by a team of highly-trained, qualified technicians based at Powermite’s countrywide branch network.